This extremely fast 34ft custom L&H Walkaround Express with a 12ft beam powered by twin Cummins 330HP turbo diesels fishes out of Los Su eños Marina. 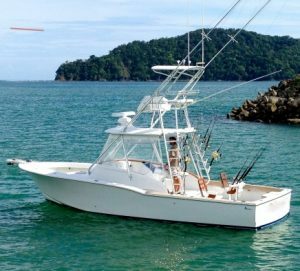 It was top boat at the prestigious Offshore World Championship at Pez Vela Marina, Quepos, in 2013, coming ahead of 67 other captains. It was second at this tournament in 2015. Cruising at 28knots with all-round fishability ideal for popper fishing, live baiting and jigging as well as trolling, she has two fighting chairs, a marlin tower with full controls, Rupp spreader riggers, a shaded helm with seating for six anglers, a/c cabin, marine head and state of the art electronics including two 12-inch Furuno Navenet GPS; 72-mile radar, powerful 1kw sounder/fish finder, etc. There are two live wells, tuna tubes, Shimano reels, custom rods, 20-80#tackle plus a wide assortment of professional grade spinning and jigging setups for jigging and popping, inshore and offshore Shimano Terez and Trevala rods, Saragossa spin reels, Torium and Tyrnos jigging reels with Spectra lines and fluorocarbon leader, and Cannon electric downrigger.